Do you think you need to use products based on the porosity level of your hair? Porosity is defined as how well your hair absorbs and retains moisture. Chemically treated or thermal styled hair is highly porous, which means that the cuticle of the hair has openings or gaps that allow too much moisture into the hair, which can cause frizzing and tangling. High porosity hair can lose moisture quickly, making your hair feel dry, brittle, and prone to breakage. Using products with ingredients designed to seal, strengthen, and help maintain a proper balance of moisture is best for high porosity hair. If you are looking for these three components in a hair mask, try the SheaMoisture Mongongo & Hemp Seed Oils High Porosity Moisture Seal Masque. In the salon, I tried this mask on a client with Type 3c hair. She has permanent hair color and frequently blow-dries and flat irons her hair. The SheaMoisture Mongongo & Hemp Seed Oils High Porosity Moisture-Seal Masque strengthens, provides great slip, and leaves the hair feeling soft to the touch. The SheaMoisture Mongongo & Hemp Seed Oils High Porosity Moisture Seal Masque has hemp seed oil to strengthen the cuticle and prevent moisture loss and mongongo oil to seal moisture and protect the hair while heat styling. The product has hydrolyzed soy protein, which has the ability to balance protein and moisture in the hair. The SheaMoisture Mongongo & Hemp Seed Oils High Porosity Moisture Seal Finishing Elixir works well to give wash and go styles, twist outs, braid outs, and protective styles a boost of shine throughout the week. You can also use this product to seal in moisturizers or leave-in conditioners. It is a heavy so I would not recommend this product if you are wearing your hair blown out or flat ironed. If you want to try it on your hair while it is straight, I recommend spraying a small amount in the palm of your hands, rub your hands together to dilute some of the oil and then apply the oil to the mid shaft and ends of your hair. This oil has ingredients that truly add moisture to high porosity hair. Safflower seed oil is used to nourish and hydrate your hair. Macadamia seed oil helps reduce frizz and tangles. It adds lightweight shine and helps the hair feel soft. The Mongongo & Hemp Seed Oils High Porosity Moisture-Seal Styling Gel is a styler that provides great curl definition and should be used if you want a little hold with your styles. This gel dries fast but you have to be careful not to use too much because it will flake. This product spreads nicely throughout the hair, which can help you not to apply too much. I used the gel on Type 4a hair to do a twist out. My client had curl definition and her twists were elongated. I let her twist dry under a hooded dryer for 45 minutes until it was completely dry, which helps the hair to set in an elongated state. If you suffer from dryness, I would not use the gel from this collection. Try Shea Moisture’s Coconut & Hibiscus Curl Enhancing Smoothie style your hair and retain moisture instead. 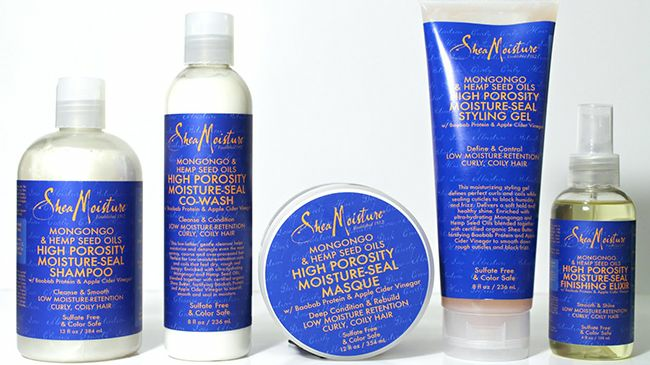 Have you tried any of the Mongongo & Hemp Seed Oils High Porosity Moisture-Seal products by SheaMoisture? What are your favorite products?